Beginning in the 16th century, settlers from many European countries came to North America, including: Finland, Germany, Holland (the Netherlands), Ireland, Scotland, Sweden—and especially England, France and Spain. These settlers arrived seeking a better life, profit, and religious freedom. England eventually exerted control over the new land, and established the 13 colonies that became the United States. If you are exploring your ancestry all the way back to the Colonial period in U.S. history, this Infographic will help—providing a timeline and facts to help you better understand the times your ancestors lived in. Click here for the larger version of the Settling America Infographic. Does your family history in America begin before the United States became a country? After Christopher Columbus’ voyages, many European countries came to the New World—but eventually Great Britain became the dominant power in North America. This timeline shows some of the key events in the settling of America, as settlements and colonies became the 13 British colonies—leading to the original 13 United States. Long-established American families have family trees that stretch back to the Colonial Era in the 17th and 18th centuries. Finding vital statistics and other genealogical information about these early Colonial ancestors from that time period can be difficult, as some vital records simply were not officially kept before and during the 1700s, or have been destroyed through war, accident or the passage of time. Fortunately, GenealogyBank offers a rich genealogy resource for family historians tracing their family trees back to Early American times: an online collection of 27 Colonial newspapers, providing obituaries, birth notices, marriage announcements, and personal stories to get to know your pioneering ancestors and the times they lived in better. Download our printable PDF list of Colonial newspapers for easy access to our historical archives right from your local desktop to begin researching your genealogy back to the Colonial period. 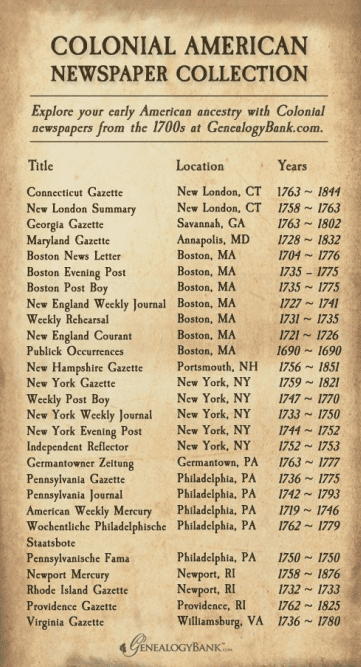 The list shows the individual Colonial newspaper titles we house in our historical archives, ranging from the first newspaper ever published in America up to publications from the late 1800s. After you’ve downloaded the PDF, click the newspaper titles to be taken directly to the search landing page for that publication. Just click on the graphic below to start your download. Thanks, Joanne. We had to omit several facts and dates in order to make the timeline a moderate size and not too unwieldy, but we appreciate you pointing out this important 1634 event to our readers.